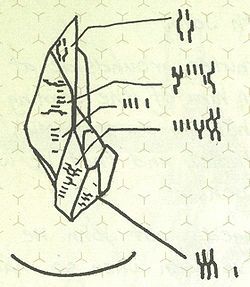 The artifact, as drawn by Dr. Halsey. The Sigma Octanus IV Artifact is a Forerunner artifact first identified as such when it was on display in the Côte d'Azur Museum of Natural History on Sigma Octanus IV. The artifact was a crystalline object that contained a star chart embedded within its structure, with coordinates leading to the Soell system, where Installation 04 is located. It featured Forerunner symbols synonomous to those found in the xenoarcheological site beneath SWORD Base on planet Reach. The artifact arrived on Sigma Octanus IV in the form of a meteor some 60,000 years before human occupation of the planet. The human inhabitants of the planet later found the artifact and placed it in the Côte d'Azur Museum of Natural History. During the Covenant invasion of Sigma Octanus IV, the Covenant attempted to seize the artifact from the museum, only to have the operation foiled by the SPARTAN-II unit Blue Team. Aware of the potential intelligence value, the Spartans extracted the artifact from the museum before detonating a HAVOK tactical warhead in the city. Scans of the artifact were later given to Cortana and Dr. Halsey, who attempted to decrypt its contents as a form of language. During the Fall of Reach, Cortana successfully translated the artifact in a form of a star chart instead of a language, leading the UNSC Pillar of Autumn and its crew to Installation 04.